The fact that the bitcoin price has been crashing for the past month has led some people to have some hilarious reactions. From rage-quitting crypto-trading and investing to astonishing doomsday predictions, it’s really fun to sit back and watch all madness. However, I feel like it’s also my duty to step in and calm things down for a second. Honestly, this “crypto-bubble” you’re tired of hearing about hasn’t popped. It hasn’t even begun to form. If you don’t believe me, you’re in for a treat, for today we’ll discuss how perspective and the ability to see things abstractly is an asset when properly used and why so many people lack the vision to see things clearly. I’m not saying I’m an all-knowing guru. That’s not the point. The thing is that people get excited and really want to work for those likes and shares. That’s all fine; it’s the world we live in today, not here to judge. But, c’mon; at least have the decency to put things into perspective. Do you know how big the dotcom bubble grew before bursting? Do you have any idea? When the dotcom bubble exploded, close to 20 years ago, the total market value was around $6.7 trillion. In today’s money, the value of each USD is about 40 percent lower. This simply means, if you were to compare to 2000’s prices to 2018’s prices, this bubble would have reached more than $9 trillion. See where we are now? We’re about 1.5 percent into the bubble. How frightening. How Much is Crypto Worth? Right now, the current mindset is that cryptocurrencies are in some sort of downward spiral, with no hope ahead. According to some news sources, that is. Obviously, when we look at the bigger picture, we can clearly see that is not the case. The entire cryptocurrency market cap has devalued more than 70 percent since its peaks highs close to $1 trillion, during early January this year, which has led some people to believe we’re finally out of luck, and there is little hope crypto will recover any time soon. Of course, it’s always at the most desperate moments, when hope is all but gone, that we’re given another chance. I don’t think we’ll see prices for such low prices for much longer. Soon, there will be an upwards correction. If you need more fundamentals, besides Bitcoin’s hash rate maintaining a steady uptrend and more people actually using bitcoin in countries like Venezuela (which kind of proves its point), we could use, perhaps, an alternative argument. I would ultimately argue its price should at least be a little bit higher than McDonald’s. Visa handles far more at about $30 billion a day, or $11 trillion a year according to their self-disclosed stats. That’s with a capacity of 65,000 transactions a second. Bitcoin can handle only about 7 tx/s on chain, or about 0.01 percent of Visa’s. Yet bitcoin transfers about 25 percent of Visa’s amount of value processing. In their recent quarterly report, Mastercard said they processed $4.4 trillion in the year to date, while bitcoin would be at about $3 trillion on a yearly basis if we extrapolate from the daily $8 billion — a level that is fairly common for BTC. Bitcoin is close to overtaking Mastercard by the amount of value transferred daily. This really makes me wonder: What is the big deal of using bitcoin mostly as a store of value? Even if it’s slow and boring, it’s much, much safer than any centralized third-party settlements layer. There is also a lot of action currently behind the scenes as institutions prepare custody solutions to allow institutional money from endowments, hedge funds, state pension funds, etc., to join us brave privateers that beat them to this New World of cryptocurrency and blockchain. Bakkt even announced their first contracts for BTC would be a one to one ratio. But way more exciting is what comes next. Have you wondered why the last time there was direct Chinese participation, the total market capitalization went up 881 percent in 6 months? Currently, the Chinese yuan accounts for only 0.79 percent of bitcoin’s daily trading volume (give or take). When was the last time the Chinese public had straightforward access from yuan to bitcoin anyway? December 2013. Almost 5 years ago. 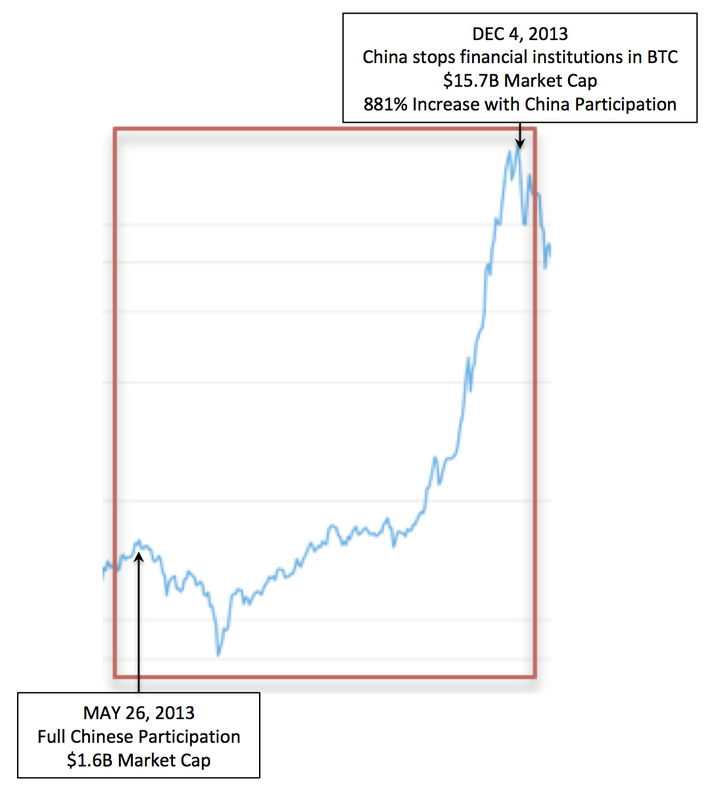 China stopped mainstream financial institutions on the mainland from dealing with bitcoin in December 2013, when the overall market cap for all cryptocurrencies was only $15.7 billion. It drives me nuts just thinking about what’s to come when most countries open their doors to cryptocurrencies — one way or another. Yes, even through centralized digital currencies, backed by governments, which will happen sooner or later. Just by looking at Dapp Radar, a website focused on showing statistics about decentralized applications, we clearly see there isn’t much adoption yet. That means that it seems a tiny bit too soon to jump into any sort of conclusions, about future use-cases. That is, most dApps have been released either in 2017 or 2018, so there hasn’t really been enough time to properly implement token-models which leverage tokens in the most amazing ways possible – which to me will be a huge catalyst for user adoption. “We are orders of magnitudes away from consumer adoption of dApps. No killer app (outside of tokens and trading) have been created yet. Any seemingly “large” dApp (ex. IDEX, CryptoKitties, etc) has low usage overall. “All of the top dApps are still very much about speculation of value. Decentralized exchanges, casino games, pyramid schemes, and even the current collectible games (I would argue) are all around speculation. “What applications (aside from value transfer and speculation) really take advantage of the true unique properties of a blockchain (censorship resistance, immutability of data, etc) and unlock real adoption? “For new protocol developers, instead of trying to convince existing dApp developers to build on your new platform — think hard about what dApps actually make sense on your protocol and how to help them have a chance at real adoption. Without Litecoin we wouldn’t have a live testnet for bitcoin improvements. Or without BCash we wouldn’t have a blockchain with 32mb blocks. What about Ethereum? Thanks to this protocol, have an easy framework to deploy cryptocurrencies and smart contracts. Without Steemit we wouldn’t have a decentralized, incentive-based, social network. Without the Basic Attention Token we wouldn’t have Brave, a decentralized browser that pays content creators. Do you like privacy? Well, without Zcash, we wouldn’t have ZKsnarks, providing anonymity and privacy in the blockchain technology. Or without Stellar, we wouldn’t have institutions looking at public blockchain solutions. Finally, without Aurus we wouldn’t have a stablecoin based on tokenized gold assets (much safer than tether and its “peg” to the USD). There’s clearly much work left to be done. What’s the best thing to do now? Well, I don’t know about you, but I’m surely going to take advantage of these continuous Black Friday bitcoin prices and increase my holdings. At the end of the day, bitcoin’s still one of the most (if not the most?) best-performing assets since its inception, close to 10 years ago. 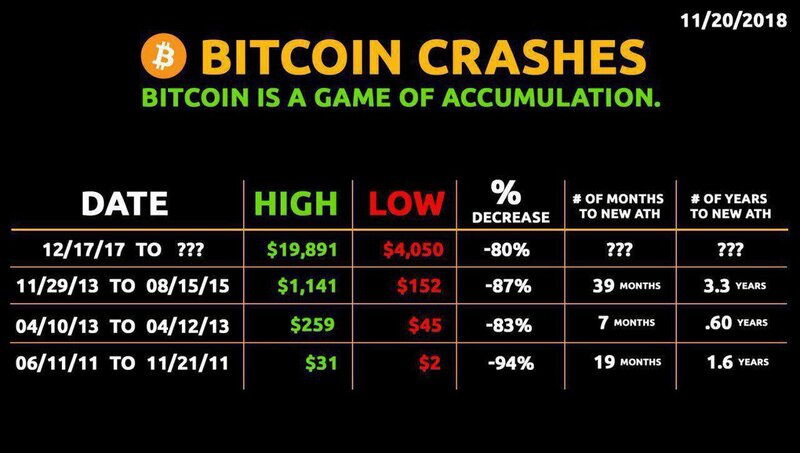 Just think about the dozens of times we’ve seen bitcoin crashing. Since bitcoin plunged from an all-time high of nearly $20,000 to its current price around $4,000, crypto naysayers such as Warren Buffett, Jamie Dimon, and Nouriel Roubini reiterated their position that the crypto markets will end poorly, while crypto bulls point to bitcoin’s previous crashes and multiple comebacks. One interesting thought is that on each crash, the average percent decrease from highs to lows has been smaller on each bear market. That’s definitely a very good sign! The reason why we need to take a break from time to time and look at the bigger picture is to put things into perspective. Bitcoin is still in its early days, and I’m quite confident, due to past history from multiple markets, we’ll still be able to see huge bears and bulls. If you’re patient enough, of course. Don’t forget, buy when there’s blood in the streets!